I was out the other morning down by the local river, taking advantage of the weather. We’ve had a lot of rain recently, so the fields were flooded, but, there wasn’t any rain that morning, meaning I could get some pictures. It was the perfect storm, except without the storm. To get there though I had to drag myself out of bed and face the all-encompassing view of endless sombre clouds in the half light. It wasn’t a sight to put a spring in the step of even the most enthusiastic person, never mind someone as barren of vigour as I am in the mornings. 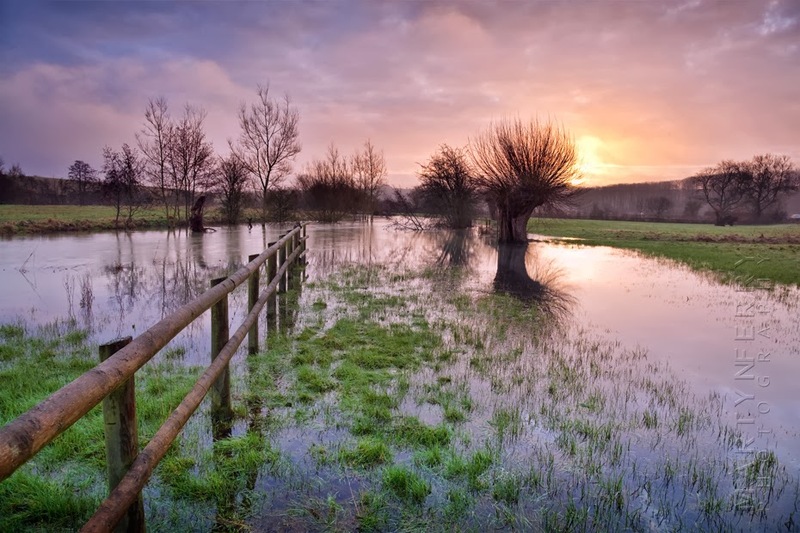 So with a yawn, I lurched to the car for the short trip through Burford and along the Windrush Valley, to meet up with the river and its copious overspill, which I hoped would provide some nice effects to complement the rising sun. But first there had to be sun, or the whole idea would just fall to dreadful pieces. Trust me, I have been taking landscapes for long enough to know, if it’s a nice reflection of the sun you want. It’s no good shooting turbid, featureless clouds, the type of clouds that would make even chirpiest of us start cutting themselves, and just hoping a ravishingly divine sunrise appears when you look at the image later. After a spell of wandering around the murky, sodden ground and cursing everything I could think of for my predicament. I was surprised, and not a little pleased, to see some brightness on the horizon, there was indeed a break beginning to form in the clouds. So while I congratulated myself on how well I’d done to get out at this hour, and with such good spirits as well, I quickly set up the tripod and made ready for the dawning of a new day. Once I’d done my duty by the sunrise before me, and as it headed up into the sky, I traipsed off to have a bit of an exploration, to see what other watery virtues I could stumble across. 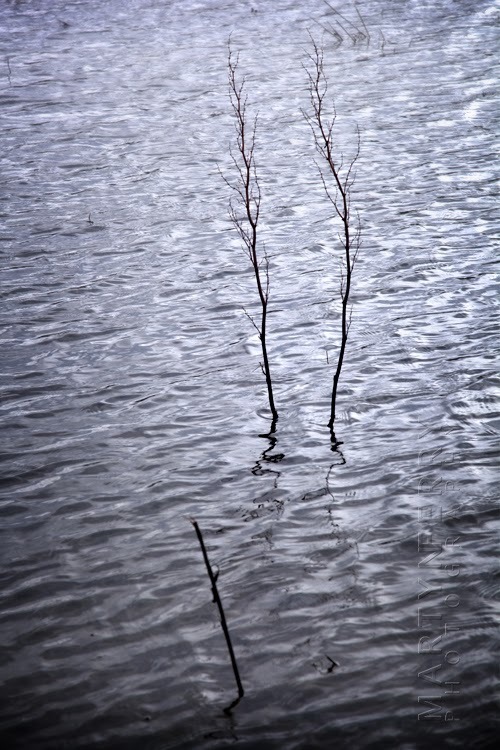 But instead of looking for more landscapes, I was drawn to the smaller views all around me, what I call the quiet images. These shots are the polar opposite of the loud, brash colourful images of sunrise and sunset and their ilk, the ones that grab all the attention and throw their weight around like they’re the greatest thing since sliced bread. The quiet images are the retiring, thoughtful and subdued types, the ones who don’t give much away, but hide their charms for those willing to spend some time with them. These were the scenes I was scouting for, and I found them in abundance. 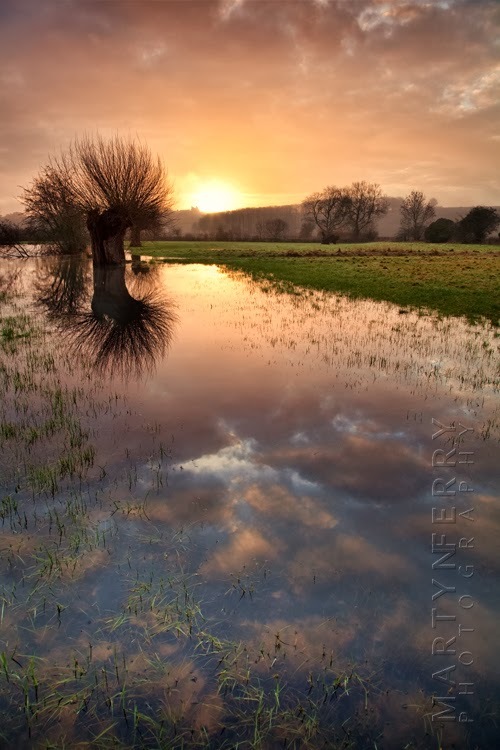 Who’d have thought a flooded field could be so meditative, or should I say reflective? Ha ha. No, perhaps not. So in a contemplative mood, I squelched my way back to the car and mused righteously on the bacon sandwich that was waiting for me back home. I agree Martyn, the quiet ones are every bit as interesting as the noisy ones! The River Can has finally succumbed, so I might get the big boots on myself and go for a good old squelch over the weekend! Hope you had some luck last weekend! I would image the water will be even higher this weekend, it certainly is round here.